Chang is Thailand’s favourite beer, not necessarily the best beer in Thailand but it has all the ingredients to make it the most remarkable beer in Thailand. Soon after it’s launch in 1995, Beer Chang (Elephant Beer) had captured the elephant’s lions share of the Thai beer market and overtook Singha beer as Thailand’s best selling beer. The meteoric rise of Beer Chang has to be credited to a blend of excellent marketing by the producers (ThaiBev), an agreeable taste and a price tag which makes it one of the cheapest beers in Thailand. Year on year, Beer Chang has outsold it’s main Thai competitors and foreign imports, including Heineken and Singapore’s Tiger Beer. See the photo below, you think that label looks distinctly familiar, that’s because it is very similar to the Carlsberg label/motif, Carlsberg and Chang were actually in partnership from 2000 to 2005, after a drunken fight bust up Chang claimed millions of dollars in compensation from Carlsberg. Since Beer Chang and Carlsberg went their separate ways, Carlsberg has been scarce or not available in Thailand, it is rumored though that the popular Danish premium beer will return after a new deal with Chang’s bitter enemy the Singha Corporation. Chang is probably Thailand’s most famous beer. 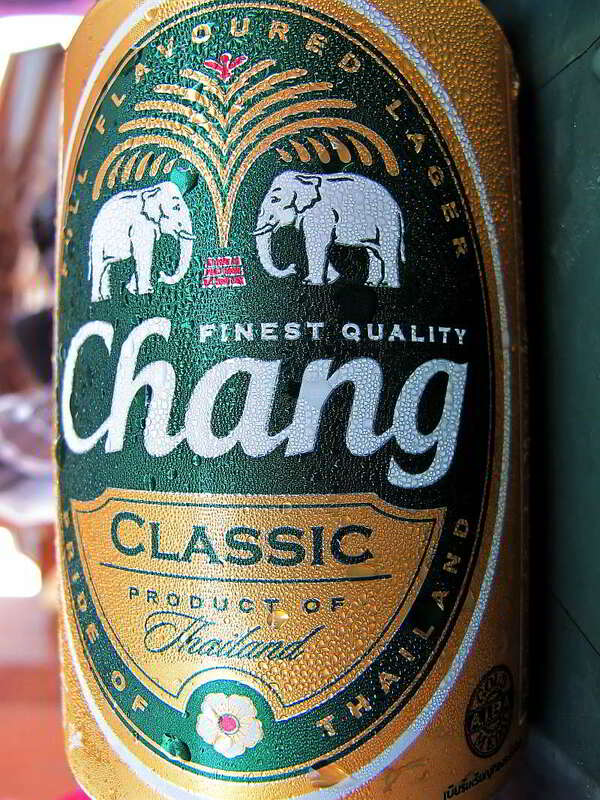 Besides being the most famous and talked about beer in Thailand, Chang is also the most renowned for it’s effects and after effects, noted for it’s strength of about 6.4%abv, getting drunk from Beer Chang is like being charged by a wild elephant, it doesn’t happen slowly, one minute you’re sober, the next you’re drunk as a skunk. The best way to describe the taste of Beer Chang is to compare it to Thailand’s most popular imported beer, Heineken, you might say that Chang has a strong taste of hops, if you drink a Heineken afterwards you will probably remark how sweet the Heineken tastes. Chang is remarkably flat and the head soon fizzles away, but it’s easy to drink despite being a little heavy. The after effect of Beer Chang is often a raging hangover, described as unique to Beer Chang it has been termed as a “Changover”, many people believed that formaldehyde was added to Chang to keep it preserved, this in turn was blamed for the unique hangover. As they say in Thailand Chok Dee Khap (cheers) and good health.